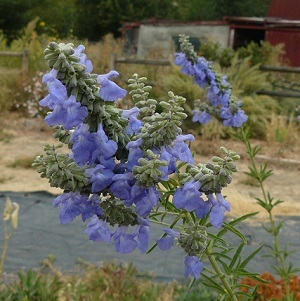 Azure Blue Sage is a tall, late-blooming Salvia. Brilliant blue tubular flowers on slender, arching stems provide dramatic late- season color in the garden. Disappears in winter and comes booming back from the roots in spring. Great late-season food source for bumble bees, honey bees, butterflies and hummingbirds! Tolerates clay. Height x Width: 3-4 ft. x 3 ft.